I have been wanting to share a listing of my favorite “go to” websites for homeschooling. These sites offer everything from free curriculum to record keeping forms. Whether you need to put together a curriculum or simply want something to give your child extra practice, you will find what you need among these sites. One use that I have for the printables on these sites is worksheets or activities that fill in the gap on days when I am sick. It is worth it to print up some of the worksheets and keep in a folder just for that purpose, Then, on days when you are not feeling well or your family is extra busy, you already have a grab and go file of materials ready. I love the fact that I can simply print out the pages I want and tuck them into the kids’ workboxes and have them ready to go. I like to take pages, such as math drill sheets, and place them in a sheet protector. This makes a nice dry erase activity page to review topics such as multiplication tables. By using the dry erase marker, your child can use the same drill sheet many times. I place a sheet of plain cardstock behind the printable to make the page more sturdy. Before the holiday season is upon us, I like to find holiday themed lapbooks and printables to file away. Once the holiday season arrives and life gets busier than normal, I can pull these out of the files for the kids to do. You can find holiday themed curriculum for almost any subject. Each of these websites are ones that I have used with our children. This list is by no means everything that is available. I am only sharing the ones that we have used ourselves in homeschooling. I hope that among the pages listed, there will be some that you find helpful as well. For Bible studies, here are some really good resources. Homeschooling has already begun in our home. With each child doing very different curriculum, I had to come up with a record keeping system that works for us. I have tried various methods in the past. Free downloads of record keeping forms, purchased downloads, and even the lesson planners from the store. Nothing felt right for me. No matter what system you use, it has to fit into your routine and be easy to use. If it is labor intensive, then there is a good chance you won’t use the system for very long. Here is a list of what is in my binder. This is where I keep the information that I need ready access to. Included in this section are the following. Attendance – the calendar that I chose for this was found on FiveJs.com. The 2014-2015 calendar that I am using begins with August and ends with September 2015. On this form, I am able to color code the dates for holiday breaks, days we are doing school, and field trips. It gives me a neatly prepared attendance record that will be a cinch to keep up with. Curriculum Resources form from 2Dynamic Moms website. This form has space for up to 4 children. On it, I have listed all of the materials each of the kids will be using. I loved this form over many others because it also includes space for lapbooks, games, websites, and magazines. Often as homeschoolers, we use non-traditional resources for educating the children. This form allows me to list them well. I also like the fact that if I chose to do so, I could use 1 copy of the form per child. This option would allow me to list the materials used during each quarter of the school term. Passwords Sheet – If you are like me, you may forget a password from time to time. I typed up on the word processor a list of the educational websites. Included for each site is the log in information. This is especially helpful if your spouse or children need to access the website. Pookie’s Unit Studies – Pookie is doing a curriculum that is unit study based. Each week he has a different theme around which all of the assignments are based. I made life simpler for me by printing out a copy of the Unit Study Planner. I designed this one-page form that will give me a quick overview for the year. I don’t need a weekly view of the activities since his curriculum came with the lesson plans. I am going to be photocopying the lesson plans each month to add to this section. The next 4 tabs are for Little Miss. Her lesson plans are set up by the quarters. form as it includes 2 check off boxes for each subject. I am using this to record each day’s assignment. When she completes an assignment, I check off one box. The second box, I am using to record her grade. I also have added a reading log to each quarter. At the end of each quarter I have a grade form. On this, I will be able to have a ready reference to her grades for each subject. I use the same forms for each of the 4 quarters. Under this tab, I have printed out pages such as the listing of lapbooks available from Homeschool Share. By having the master list of what is available, I can easily locate what I may need for each child. One of the most often used sections of Homeschool Share is the Workboxables. This listing contains everything from file folder games to flash cards. The list is divided up by subject. There are a few empty tabs behind the ones listed above. Those are for anything else that I may come across that I would like to print out for quick reference. Lastly, in the back of the binder, I have a manila envelope. This is used to store the paper receipts that the library prints when you check out books. It is yet another way to record the materials used/read throughout the year. Well, that is it. This is the system that I am finding to be the most helpful with tracking our homeschooling. Hopefully, it will give others some ideas. 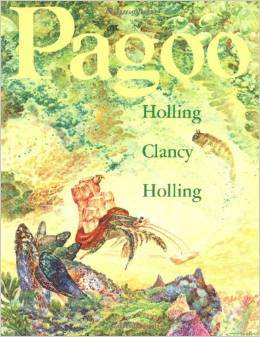 One of Little Miss’ favorite books is “Pagoo” by Holling C. Holling. Pagoo is the story of a little Hermit Crab, told from his perspective. The story starts at the very beginning of his life. Pagoo is guided by a character known as Old Man. Old Man is best described as the inner voice of Pagoo’s instincts. One of the aspects of the story that I love is that it is detailed in what life in the tide pools is like. We learn about the various life forms. The pictures in the book are outstanding in their detail. On one page, you have very colorful drawn scenes from the tide pool. On the facing page, there are sketches of various life forms in the color picture that are drawn in detail and labeled so children can identify what each life form is. We found a very thorough unit study on Homeschool Share. This free printable unit study comes complete with notebooking pages for each of the 19 chapters. There are also pages for General information, Mid-book Review, and a Book Report. We are repeating the story this term. Little Miss had read it last term, but this time will be doing the pages to go with it. She truly enjoyed this story and learned much from it. Each time she reads it or looks at the illustrations, she finds something new. It is fun to watch a child be so excited about books! In that, we have been very blessed. One of the things that I have been finding to be really helpful for our son is the use of visual aids. When he is challenged with trying a new activity, a meltdown is usually imminent. He has a fear response that he has to work through. One of the ways that he expresses his distress is to let out a loud, high pitched scream. 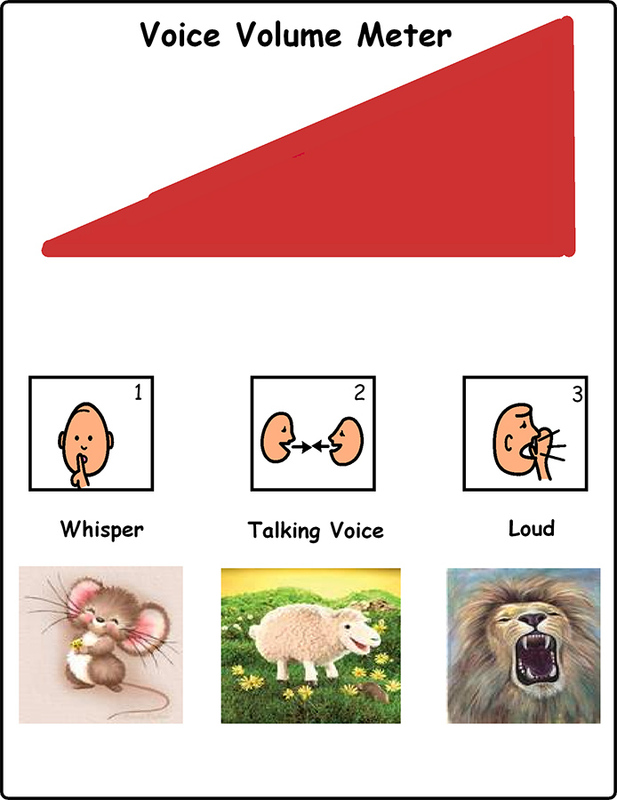 In an effort to help him regulate his voice volume, I found this cute volume meter on E-Learning. 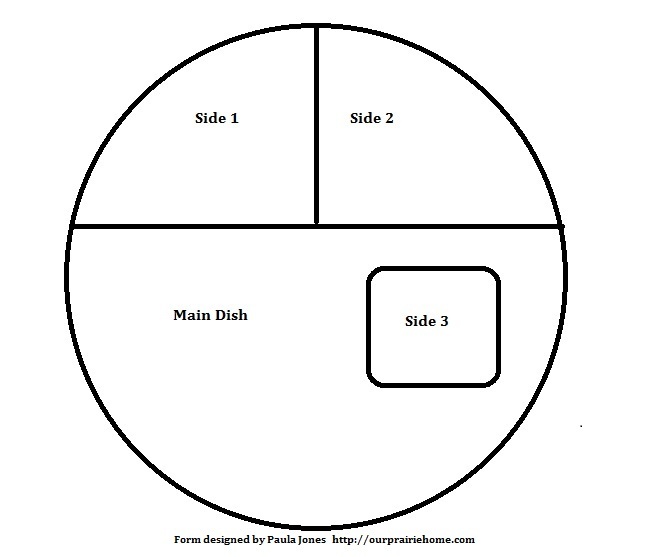 Often used for autistic children, charts like this are just as effective in use with typical children who are not yet reading. All children can use visual schedules to help stay on track with chores or home routines. You can find these at E-Learning as well. By using visual aids, you can bring independence to your children. 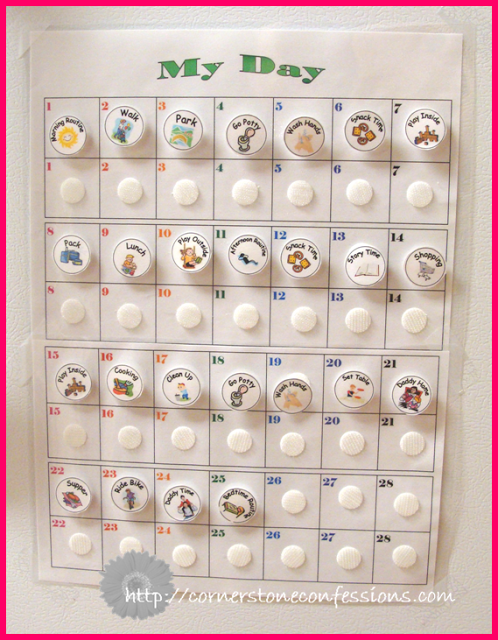 One of my favorite daily routine charts for kids is one made by Kathy at Cornerstone Confessions. The free download gives you several options to choose from. What are some of our favorite visual aids for autistic children? Are there some that you find more helpful than others? One of the most rewarding things that I have done with Pookie is use PECS communication cards with him. When I first began, it was during a time when he was not receiving speech therapy. Long story there, but it took us a while to find one who knew how to work with a child with his severity of autism. In doing a search online (got to love the Internet) I found the step by step instructions from a college which tells you exactly how to implement PECS with your child. The outline was designed for a college course handout, I believe, but I was thrilled to find it available for download here. I next did an online search for free printable PECS cards that I could start out with. Why re-invent the wheel, right? I found many that I could use, but I just couldn’t seem to find exactly what I needed. Then, I found SENTeacher.org where I could design my own cards using their graphics search engine or uploading my own graphics, I loved using their site when I had time at a Wi-Fi location. Problem is, I live in a rural area with only a prepay MiFi device for Internet service and its signal is sketchy at times. This required me to find another way to do the cards offline. I opened up my Open Office program and made a template of a graph that is 5 columns across and 6 rows down. This gave me 30 squares that are about 1.5 inches in size. I saved this template so that I wouldn’t have to rebuild it each time. Next, I started making a list of the pictures that I needed the most. I can always add new ones later. I mainly wanted the ones that were needed at that time. Some examples were daily routine pictures, chores, favorite snacks, his sports bottle that he always drinks from, and favorite toys and activities. I organized the PECS graphics on the template by category. This will help out later on when you are filing the cards away for storage. I went back to the template and gave the template a category name at the top of the page. Then, I copied each of the graphics for that category onto the template. At this point, you can add word labels to the graphics if you want. I chose not to when making Pookie’s cards. Once the template is complete, I saved it both in PDF and in Open Office’s document formats. The PDF makes it easier to print at the office supply store. Yet I still have the document file so that I can easily edit it later on. I print out 2 copies of the PECS cards. Both copies are heat laminated. One copy is cut apart to make the cards and the other is an indexing sheet. When I am storing the cards in the main PECS binder, I am storing the cards on their indexing sheet. This method allows me to see at a glance what cards, if any, are missing. When making the cards, one thing to consider is whether or not ot print them on paper or cardstock. It is really a personal preference. If heat laminated, the ones printed on paper work very well if only used with one child. If you are making them for several children to share, such as in a classroom setting, then cardstock may be a more durable option. Some people may want to consider printing and laminating an extra sheet of the cards to store away in a file folder. These will give you a ready supply of replacement cards in case cards are lost or damaged. If you don’t have ready access to a printer or a heat laminating machine, this may be a good option to consider. It will save time and frustration later on. Know your child! Some kids do well with the simple line drawing style of cards while others do better with picture graphics. Never use contact paper or the self-stick type lamination that does not require heating. The adhesive on the Velcro or magnet tape does not adhere well to it and will pop off rather quickly. Always heat laminate. Once the adhesive on the Velcro or magnetic tape adheres to the heat laminated cards, it is very difficult to remove. Keep a note card handy for jotting down items that you find yourself needing a card for. Many times, I have been sure that I would remember what I needed to make cards for, only to find my mind going blank when I tried to recall the items later on. Be prepared to tweak the system. The storage methods that work for some, may not work for another. It takes time to get into the rhythm on how the PECS works best in your family. Don’t be afraid to try various methods for using the cards. These are a tool and not meant to be used in a rigid fashion. Some children do well with handing the cards to you, while others simply point to the card. When used in visual schedules, some kids are good at removing the card and placing it into a “finished” pocket or basket, while others may do well simply moving the card to a different position on the chart. Do a search on Pinterest for PECS communication and visual schedules. You will find a huge array of ideas and options available. Just as working with autistic children is not a “one size fits all” undertaking, neither is the way PECS communication and visual schedules use in the home. What works for one child may not work for another. Again, this is a situation of learning what your child prefers. Go slow. There is no need to expect a child to grasp the full program of using PECS communication in a short period of time. It takes a while to get through all the steps. Some children may take more time than others. It isn’t a race or a competition. Just go at a pace that your child can respond best with, while still challenging them. Remember that the foundation laid in each step needs to be fully build before adding the next phase. Stay positive! Yes, there will be times of frustration as you go through the process of teaching PECS communication to your child. This is the same with or without a therapist using the PECS communication system with your child. You will have times when it just doesn’t click. Take heart! The rewards at the end will far outweigh any frustration that you and your child may feel along the way. Teaching Pookie to communicate has been both a challenge and a great blessing. With each step forward, he has fewer and fewer meltdowns. With him, most meltdowns have always taken place due to frustration. Once he began to learn that he could make choices or make his desires known, the meltdowns have subsided. Now, the only true meltdowns that he has are those involving sensory overload or other sensory based issue such as his problems with transitioning from surfaces or doing something new. It has been a journey, and we are still progressing through the steps with learning to use PECS communication. The progress is slow. Mostly because I am doing this on my own right now. But the benefits are already being seen. Good luck on your own journey with PECS communication! I hope that the ideas shared on my blog will inspire new ways to use the same ideas with your own children.